You are here: Home / Highlights / Buy Your Tickets Now for the 2019 Apple Blossom Awards! The Apple Blossom Awards honor early childhood teachers who educate and care for children birth to age five. 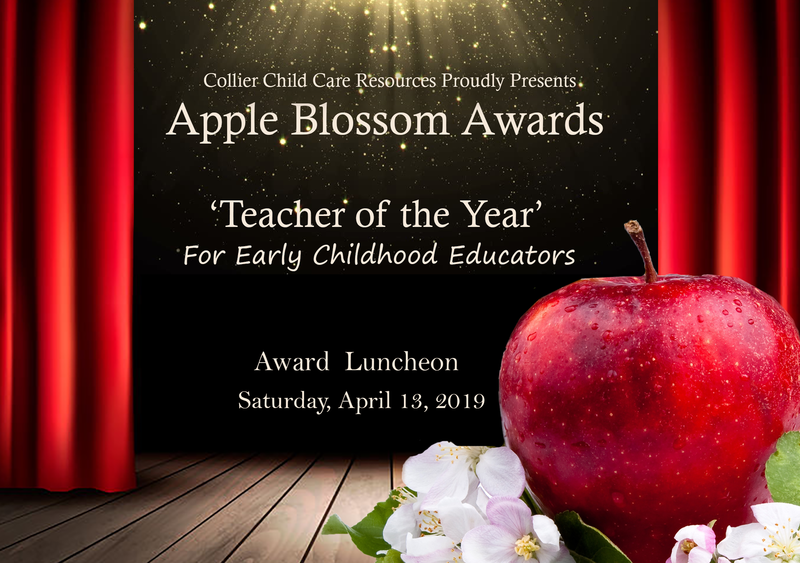 Three “Teacher of the Year” Award recipients will be named at the annual Apple Blossom Awards Luncheon, held on Saturday, April 13th from 11:00 a.m. – 1:30 p.m. at the Hilton Naples. In addition to the awards ceremony, the event includes lunch and a key note address by a guest speaker. Tickets to the event are $40. For any additional questions, contact Laura Bidireanu, laurab@collierchildcare.org, (239) 643-3908, or visit www. collierchildcare.org.